Coin design is one of those ‘hidden areas‘ of design that most people just don’t see. 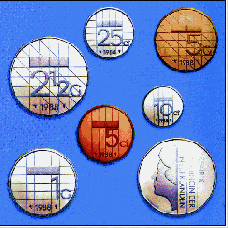 Co-founder of the Dutch design Bureau, van Eyben designed these coins in 1982. In 1998 van Eyben was commissioned to design the Dutch version of the Euro. One more conventional product design is the ‘pendant’ watch – designed in 1976. After the end of the early 1990’s van Eyben’s designs focus mainly in the area of product and graphic design. Van Eyben’s maxim is a sound principle on which to base a design philosophy and has served him well over the years of his design creations.